I'd like to buy a tree like this one. Any idea what it's called? This picture was taken near Boise, Idaho, USA near the end of July. When and where this picture was taken is also quite important to know - the Hibiscus I've mentioned flowers relatively late in summer, but there are other Hibiscus which flower earlier, particularly in warmer regions. Otherwise, tree/shrub mallows (Lavatera x clementii for instance) look not dissimilar once large, and they have similar flowers, but flower from early summer onwards - that's another (but rather less likely) possibility for ID. 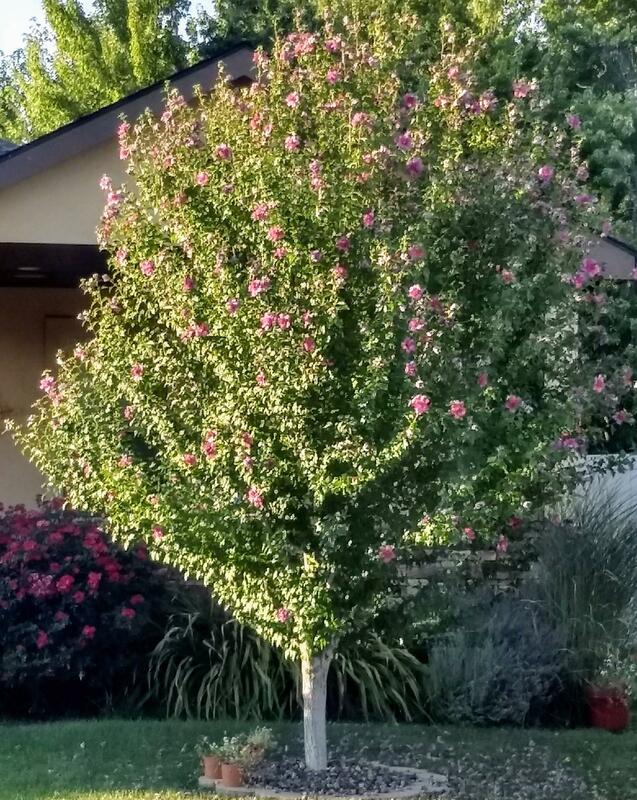 What is this deciduous tree with sharp edged leaves and clusters of small flowers? What is this tree with round yellow fragrant smelling buds? What is this tree with blue and white flowers and long strap-like leaves?